In 2008, music rhythm games was a billion dollar industry with Guitar Hero and Rock Band leading the way. Rocksmith was Ubisoft’s answer to venture into the music rhythm games. While other games only let players pretend to be a rockstar, Rocksmith teaches the player how to play a real guitar by using the instrument as the controller. One of the problems during the development was how to translate the fretboard and chords into an easily understood gameplay interface. U.S. Patent No. 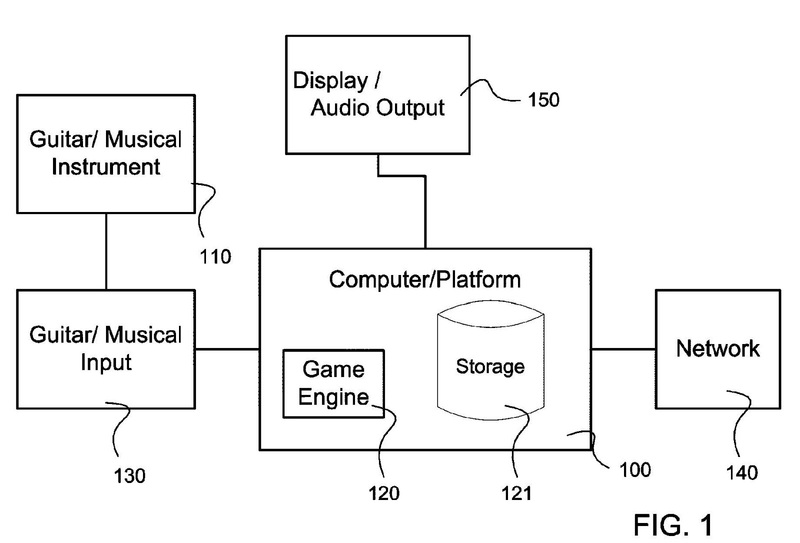 9,120,016 (the ‘016 Patent) addresses this issues and describes the gameplay mechanics of Rocksmith. Guitar Hero and Rock Band had addressed this issue by reducing the guitar down to a five button rhythm game, where button icons would travel down a vertical “note highway.” Rocksmith took the vertical “note highway” and combined it with a horizontal representation of the fretboard. As notes travel down the “highway,” the horizontal fretboard shifts left and right to the corresponding position on the guitar. Since all of the gameplay prompts corresponded with the actual chord positions on the guitar, a player must successfully play the song on a real guitar to succeed in the game. 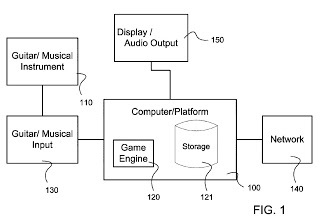 The ‘016 Patent also describes a system that adjusts to the player’s skill and provides methods for the player to improve. If a player struggled with a particular portion of a song, Rocksmith would generate a mini-game related specifically to part troubling the player. The game also provides other forms of feedback to help the player learn how to play the guitar. An interactive game designed for learning to play a guitar. A guitar may be connected to a computer or other platform, capable of loading music and displaying notes and chords and other feedback and visual learning aids on a display screen, allowing a user to read music and play along. The goal of the software or interactive game engine is for players to learn how to play a guitar. Users may operate the game in a number of modes with different goals, playing mini-games throughout the levels of the game. The game provides feedback and statistics to help users learn how to play the guitar. 5. An interactive guitar playing system as in claim 1, wherein the notation is presented in a timeline view, the timeline view having notation scrolling from right to left and a video in the background, wherein an audio output of the song is timed to the scrolling notation, and wherein the scrolling notation includes notes or chords that reach a hit area indicating to the user to play the notes or chords within the hit area.